This is in response for your memo of November 14, 1988, (copy attached) requesting an interpretation of the applicability of OSHA standards at booth rental salons. We have received the following interpretation from the National Solicitor's office; please accept my apology for the long delay in this response. To determine whether the HCS applies in the situation you describe, it is necessary to determine whether any of the individuals in the workplace are employers or employees under the OSH Act and the HCS. Neither the Act nor the HCS regulate relationships between independent contractors. Simply labeling operators or other workers as independent contractors or using a contractual agreement does not automatically transform those individuals into independent contractors or relieve a salon operator from responsibility as an employer. Instead, the compliance officer must examine the actual economic relationship between the individuals to determine if there is an employer/employee relationship. Whom do the workers consider their employer, or do they consider themselves self-employed? Who pays the workers' wages? Who establishes the level of wages? How are wages established? Who has the actual power or ability to control the workers? Who actually directs or supervises the workers' daily and overall activities, assigns work, decides whether work is satisfactory, and establishes work schedules including hours of work vacation and sick leave? Who has the responsibility, as opposed to the actual power, to control the workers? Does the workers' ability to increase their income depend on simple efficiency rather than initiative, judgement or foresight? May the workers increase their income through the exercise of business judgement? Who has control over the work environment such that hazards may be abated? Who owns or furnishes the equipment and physical worksite? And, especially pertinent to beauty salons and the HCS, who controls (and supplies) which chemicals (shampoos, dyes, etc.) are to be used? The compliance officer should use these criteria developed by the Review Commission and courts under the OSH Act to determine if a salon owner, operator or other entity is in fact an employer of some or all of the workers in the salon. The salon operator could in fact be the employer of all the salon workers including beauty operators, shampooists, receptionists, janitors, etc. Alternatively, the salon owner could be the employer of only the operators and maintain an independent contractor relationship with other workers. It is also possible that the beauty operators could be working as independent contractors for the salon owner and, at the same time, the operators could be the employers of other workers like shampooists or receptionists. After the compliance officer has determined that an employer/employee relationship exists, a determination on the applicability of the HCS should be performed. As in all other work situations, the HCS applies if an employer is engaged in a business where chemicals are either used, distributed or produced and if an employee may be exposed to hazardous chemicals under normal operating conditions or in foreseeable emergencies. In some situations, a beauty salon might qualify as a multi-employer workplace under the HCS. For example, each operator could act as an employer and hire an employee to shampoo and perform other work. The compliance officer would have to determine whether each operator and shampooist had an employer/employee relationship under the OSH Act criteria listed earlier. Then the compliance officer would have to determine if the HCS applied (does the operator use, distribute of produce chemicals in the business and is the shampooist actually or potentially exposed to hazardous chemicals). If more than one operator is an employer under the OSH Act and the HCS, then, the multi-employer worksite provision applies. I hope this information is useful to you. Again, I apologize for the long delay in this response. If you have any further questions on this issue, please feel free to contact Melody Sands of my staff at (FTS) 523-8036. 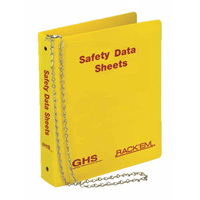 Get your MSDS binders, posters, signs and more at Safety Emporium. SUBJECT: 1. Application of OSHA Standards/Haz-Comm. to Booth Rental Salons. 2. Definition of Multi-Employer Worksite. Salon owners have learned that Booth Rental Salons do not have to comply with OSHA standards. Supposedly operators of these salons are called independent contractors, not employees. The cosmetologists in these salons work with identical chemicals in identical surroundings in identical atmospheres. These independent contractors are performing work and are exposed to hazardous materials. Although, provisions of the Written Hazard Communication Program (e)(2)(1), which requires employers at multi-employer worksites to provide other employers with MSDS has been disapproved by OMD and cannot, until further notice be enforced, it is of great importance to define multi-employer worksites for the HCS program, as well as for applicable OSHA standards. As a member of 3 different Salon Owners groups, I am writing to request 100 brochures titled "Play It Safe...Handle Hazardous Materials With Care," and any other written information available in the same quantity. Is there a charge? If these are not available in bulk, what is the fastest way for all of us to obtain the information we need? I have recently learned that Booth Rental Salons do not have to comply with the OSHA Standards. Supposedly these salons do not have to comply because each operator is an independent contractor, not an employee. In the State of Colorado, I know this is not true, for if we use the IRS definition of independent contractor, these Booth Rental Salons do not comply and a true employer-employee relationship exists. Does the owner's choice to evade taxes by calling a salon "Booth Rental" constitute sufficient criteria to them not to comply with the OSHA Standards? In every other way Booth Rental Salons function and look identical to all other salons. The cosmetologists in those salons work with identical chemicals in identical surroundings in identical atmospheres. Why do they not also deserve the same protection and have the same "Right to Know" privIleges? If you do divide those who must comply from those who do not have to, using the independent contractor factor, exactly what criteria do you use as proof? I believe that a significant percentage (perhaps as high as 75-85%) of salon owners in this area will not have to comply and the remaining salons could represent themselves as booth renters to avoid compliance. Please define the criteria you will implement. I believe this Hazardous Communication Standard is very important to our industry where the health of the cosmetologist is concerned. I also believe that Booth Rental/Independent Contractor status is simply a tax evasion tactic, and in no way should influence the safety intent of OSHA. Your prompt attention to these matters is greatly appreciated. I intend to organize education on this subject and there are hundreds of owners awaiting your reply. Ensure OSHA compliance with training materials and supplies from Safety Emporium.